Our DIY Halloween decorations are causing quite a stir! Earlier we introduced you to our mini Mr. Paper Bones, possibly the cutest paper skeleton we ever did see. 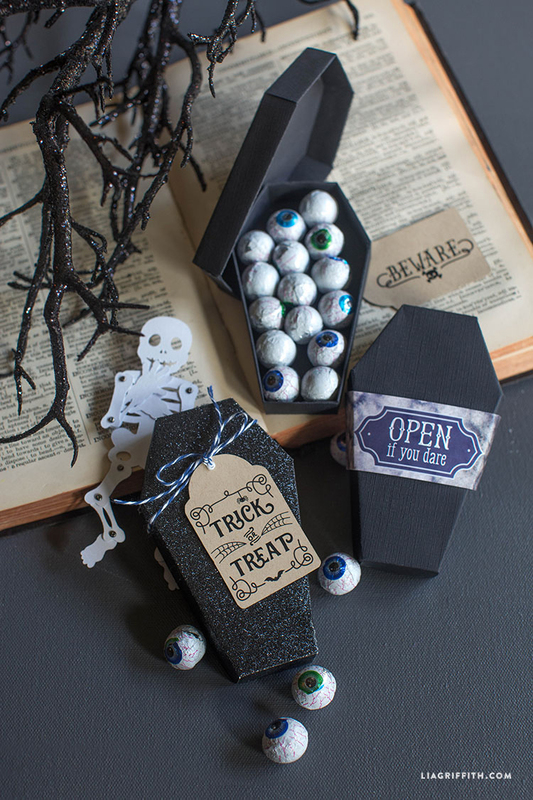 Next up we are sharing the pattern for his little paper coffin that can be used as the perfect treat box for Halloween! Made in both a matte black paper and a metallic paper version our DIY paper coffin is super simple to make with our downloadable pattern. If you are using a cutting machine then download the SVG file below. For those of you who want to cut the pattern by hand simply download the PDF template, print it onto your chosen paper and trim to size using scissors or a craft knife. Use a low temperature glue gun or regular paper glue to assemble the paper coffin and you are almost ready! If you want to make a little paper skeleton to pop inside, then head over to this post to get the pattern and instructions. 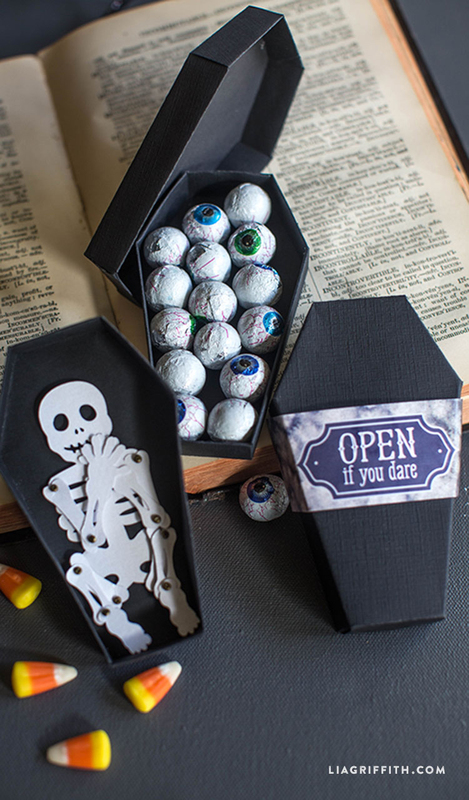 Once Mr. Paper Bones is snug in his coffin you can top it up with spooky candy, stickers and goodies for your little trick-or-treaters! The perfect Halloween DIY project! If I want to print onto two sided black card stock, is it possible to print the coffin template without the black color filled in and just use as a template? When I try and cut this file it says I need to remove exclusive content?? That happens to me once in awhile– usually I just refresh or relaunch Design Space and it works. Contact Cricut customer service if that doesn’t do the trick, it seems to be an issue on their end. So sorry! Where can I find the printable tags? Thank you for continuing to inspire me! I look forward to your e-mail everyday. Also thank you for providing PDF files, as I can’t afford a cutting machine, besides the one I provide with an Xacto knife and scissors. Boy talk about getting pattern for coffin and there it was already, thanks so much for having it so soon for all of us. Can hardly wait to make these. Will make couple to send to college Grand daughter, think she’ll get kick of out of this. Her Mom says she’s been quite home sick. Sure so miss her alot.